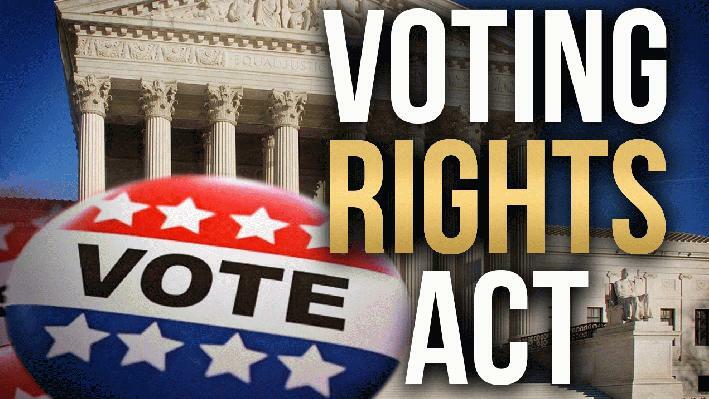 WASHINGTON (AP) - Republican Rep. Jim Sensenbrenner and Democratic Rep. John Lewis are together again to fight for a new Voting Rights law. The white Wisconsin lawyer and the black preacher from Georgia strode into the Senate hearing room together and took their seats, shoulder-to-shoulder, at the witness table. Veteran lawmakers and experts in civil rights law, they've been here before. Republican Rep. Jim Sensenbrenner and Democratic Rep. John Lewis are men of a certain age and experience amid a Congress marked by a bitter aversion to working together. Though political and temperamental opposites, they have paired up for decades on one of the nation's most painful issues – racial politics – and won overwhelming bipartisan passage when they have sought to reauthorize the Voting Rights Act. This time it's Sensenbrenner's third rewrite of the 1965 law and Lewis' second. The Supreme Court's decision to gut the product of their partnership has called them together again, but the odds of successfully persuading their colleagues to rewrite the law once again aren't clear. "This is going to be a little harder," Sensenbrenner said Wednesday after the Senate Judiciary Committee hearing and the day before a House session. "It's uncharted waters." "If anyone on the other side of the aisle can bring people to the table and get it done, this man can do it," Lewis said of Sensenbrenner in a telephone interview Wednesday night. "He is tireless. And he will not take 'no' for an answer." Influential House Republicans, such as Speaker John Boehner, aren't saying much of anything about the prospects for a bill to pass the GOP-led House. So with time ticking toward the 2014 elections and the Republicans eager to draw support from blacks and Hispanics, who overwhelmingly vote for Democrats, Sensenbrenner and Lewis are laying the groundwork for their case. They testified Wednesday before the Senate. A House panel is holding a hearing Thursday. 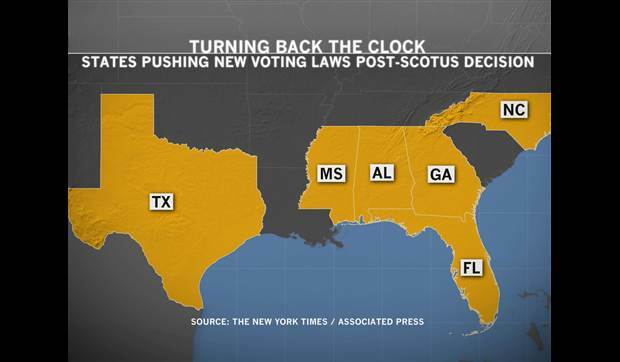 The Supreme Court voted 5-4 last month to effectively halt the enforcement provisions of the Voting Rights Act, enacted to outlaw racial discrimination against voters in local, state and federal elections. Some entire states and counties were subjected to special federal enforcement, with requirements to get approval in advance before they could make even minor changes to voting laws. Lawmakers extended the provisions in 1970, 1975 and 1982, and in 2006 Congress voted overwhelmingly to keep them another 25 years. Sensenbrenner and Lewis were central figures in the two most recent reauthorizations. The Wisconsin Republican said Wednesday the research he amassed during the 2006 rewrite, as chairman of the House Judiciary Committee, amounted to 15,000 pages. The Supreme Court decision, striking as outdated the so-called preclearance provision, means that a host of state and local laws in covered jurisdictions now can take effect without Justice Department approval. Prominent among those are voter identification laws in Alabama and Mississippi. The other covered states are Alaska, Arizona, Georgia, Louisiana, South Carolina, Texas and Virginia. Certain counties in California, Florida, New York, North Carolina and South Dakota, and some local jurisdictions in Michigan, are included. Enforcement coverage has been triggered by discrimination not only against blacks, but also against American Indians, Asian-Americans, Alaska Natives and Hispanics. Under the law, jurisdictions can break away from federal oversight if they show a clean record on voting rights for 10 years. That drew Lewis and Sensenbrenner together again on the same subject, but in a very different political climate. "The Supreme Court said it's an obligation of Congress to do this. That's a command of a separate but co-equal branch of government," said Sensenbrenner, 70. A new law, he said, should be passed before the congressional elections. He added that House GOP leaders are open to the prospect but they have to see a draft first, it must address the court's objections and it must be "politically acceptable" in the House and Senate. "The American people expect us to roll up our sleeves and get to work," Lewis, 73, said at the same Senate hearing. That's a tall order in an age of divided government and scorched-earth partisanship that faded, for now, only a day earlier when the Senate struck a deal to avert a ban on some filibusters. Democrats control the presidency and the Senate, while Republicans have the House majority. More broadly, the Voting Rights Act hearings come at a tense time for race relations. The nation is grappling with the acquittal this week of George Zimmerman in the shooting of unarmed teen Trayvon Martin. President Barack Obama, the country's first black president, has reacted cautiously to the Florida jury's verdict. And politically, Republicans are struggling with immigration reform in their bid to appeal to Hispanics and other voters who turned out overwhelmingly for Democrats in last year's elections. So rewriting a part of the Voting Rights Act is sensitive for the GOP in advance of the 2014 congressional elections. 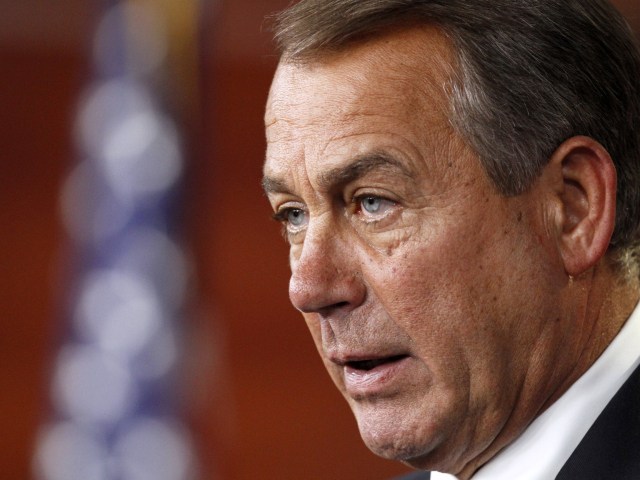 Boehner, an Ohio Republican, has not commented on the prospects for a bill. Judiciary Committee Chairman Bob Goodlatte, R-Va., hasn't committed, either. But Sensenbrenner and Lewis are resuming their well-practiced roles. "I try to be a mechanic, to put together legislation that will work," Sensenbrenner told the Senate panel. "We're going to have to repair a few parts this year." Lewis, who was beaten during a civil rights march in Alabama during the 1960s and forgave an attacker, says he tries to provide a sense of history and inspiration. At one point during Wednesday's hearing, Lewis looked to his left at Sensenbrenner. "I am very proud and pleased to be with him today. My friend, my brother," Lewis said.